the weather is starting to cool down here. mornings + evenings are becoming crisper + chillier – fall is in the air! there are many reasons i love autumn, but my favorite thing is the excuse to make soups + stews. while i’m a total soup/stew junkie + enjoy them year ’round, i know that the average person isn’t jonesing for soup in 95-degree weather. now that the temperatures are dropping, i have a reason to make tons of comfort food soups/stews for myself, friends + family again. hooray! i always associate chili with the fall + football season, so for NFL kickoff weekend, i decided to make chili. this amazingly delicious white chicken chili is a favorite with friends + blog readers, but with 2 cups of half-and-half + almost 2 cups of cheese, it ain’t the healthiest meal. so, i decided to make a healthier chicken chili. how was it? absolutely delicious! the hearty beans, the smoky fire-roasted tomatoes + the fall-apart tender chicken all work perfectly with the savory, slightly-spicy base. and at less than 300 calories per serving, it’s wonderfully figure-friendly. so, if you’re looking for chicken chili that’s as healthy as it is tasty, look no further – this one will definitely be a crowd-pleaser! sauté the onions + garlic in a pan with the extra virgin olive oil until the onions are translucent, about 5-7 minutes. put the tomatoes, chicken, beans, chiles, chili powder, cumin, crushed red pepper (if using) + 1 1/2 cups chicken stock into the slow cooker. once the onions + garlic are cooked, add them as well. stir everything until well-combined. cook the chili for 6 hours on LOW, until the chicken is cooked through + fork-tender. remove the 3 chicken breasts from the slow cooker, shred into large pieces with two forks, + return to the slow cooker. add the 1 cup of cheese + salt + pepper to taste. continue cooking for another 30 minutes or so, until the chili is bubbling lightly around the edges. note: if you use already-cooked chicken/a rotisserie chicken, you can also make this meal very quickly in a large soup pot on the stovetop. This sounds like it really doesn’t skimp on flavour despite being relatively low in calories. Perfect! Chili is one of my favorite meals – this looks and sounds wonderful. What an awesome slow-cooker recipe! This looks like a great chili to try this fall. Chili and football definitely go hand in hand! I can’t wait to serve up this amazingness with some jalapeño cornbread! Yum! this would pair perfect with jalapeño cornbread – excellent idea! Normally I’m not a big chili fan, but this bowl looks SO delish, Amy! I love that the chicken is shredded (I have problems with chunk chicken–don’t ask) and has green chilis and white beans in there. Looks super hearty! Mmmmm, football season and chili go so well together! I don’t think I’ve ever made a chicken chili, but this sounds amazing and I love that it’s on the healthier side. I’ve been making so much soup lately and it’s somewhere around a billion degrees here. AND I still don’t have a slow cooker. 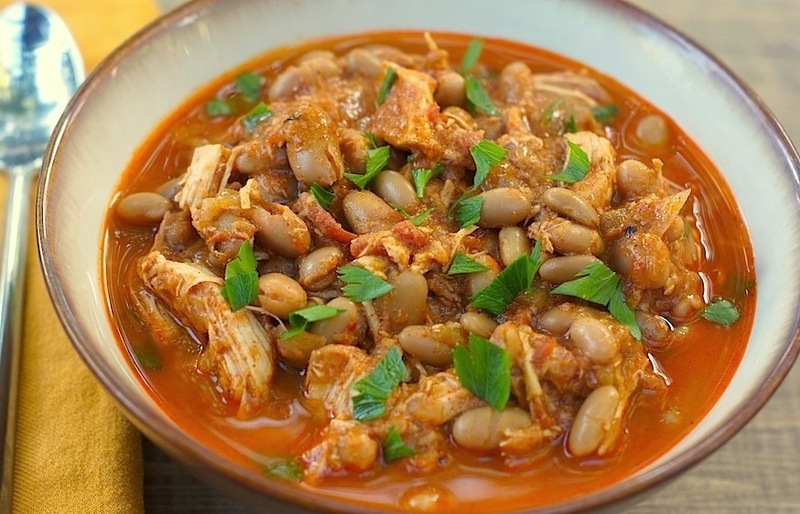 Wait… chicken chili is a thing? Had no idea. But I don’t eat chili so it’s not that shocking. But I love that you tried a healthier version and that is came out well! Yay for healthifying things every now and then. I know, I’ve said this before — but I need slow cooker in my life! That looks incredibly delish! another delicious looking recipe from the fearless homemaker! I’m diggin’ this recipe ’cause usually chicken + white bean chili is white, and I’m not a fan of white chili. not sure why..weird quirk of mine I suppose. great post + share! i like a true white chicken chili, but i do prefer tomato-based versions, so i totally hear ya! You sure have been having fun with your new slow cooker! I love mine for meats and soups/stews. I’m adding your recipe to my cold weather cooking list. I am so stoked that fall is finally here! And slow cooker recipes seem to be one of the most comforting (and easy!) ways to whip up a crazy good meal – this looks fabulous, Amy! I love this! The weather definitely is getting cooler and the evenings are starting to feel chilly so I can totally see myself making soups like this very soon. It’d be great to make a huge batch of this on Sunday too for football so then I can have leftovers – I’m sure the longer they sit, the even better they are! Yes! I found that the flavors got even deeper + more complex after the leftovers were able to sit overnight. We are HUGE soup eaters in my house–and now that football season is underway, I’m ready to start making it. Love, love, LOVE any form of chili–and (of course) I love that you added the fire-roasted tomatoes and red pepper to this. Looks awesome! Another slow cookie recipe gone right – looks delish! I love that you tried a healthy version and it came out so well! this is another great slow cooker recipe! Great recipe! Love your blog~! I find chili bit spicy, but everything is too spicy for me. Maybe I could add a bit less? Do you think it has any sense? hi Marta, You can definitely make remove almost all the spiciness of this dish. Instead of using fire-roasted diced tomatoes + green chiles, just use normal diced tomatoes + green chiles, plus omit the crushed red pepper altogether. Chili powder in itself isn’t spicy, but does have a strong spiced flavor, so you may want to use 4 teaspoons of chili powder + 2-4 teaspoons of sweet paprika instead of the 8 teaspoons chili powder the recipe calls for. Hope this helps! Another great slow cooker recipe and this looks packed with flavor!! I bet it gets even better as it sits, can’t wait to try it! What the perfect fall recipe. I woke up this morning and there was a definite crispness to the air (yay!) We live in Austin, so we’ve been aching for cooler days. This looks just delicious. Thank you for sharing…and for whetting my appetite for a warm cup of soup! Yum Yum this is so Fall, so matching of our weather and exactly the food on my mind. Mmm, chicken chili! I’m getting excited for hot soup and chili on cool evenings! ooooo….I love the sound of this…with the fire roasted green chilis. YUM. Is there anything better than fall, football, chili, and beer. Nope. I’ll take three servings. One for each round of games on Sunday. I’ve been craving a good, hearty chili. This sounds perfect! This is why I am loving the cooler weather. Its an excuse to eat chili and wrap yourself in a cozy blanket. Soups and stews are my go-to meals when the weather becomes cooler. I make extra and freeze it for busy weekdays. This chili looks amazing. Pinned! I love anything that can go in my crockpot…especially when it is loaded with fresh and healthy ingredients. I am saving this recipe to make soon! This is so delicious! I made a big pot on Sunday and have been enjoying for lunch at work! Made this yesterday with a rotisserie and my dutch oven…..so easy and so good! And just watched your segment on TV…so impressive! So glad to hear it, Dawn! 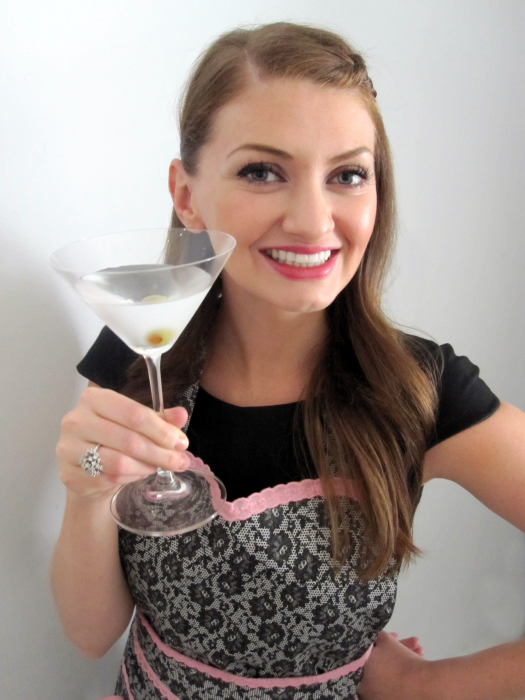 And thanks for your super kind words about my tv segment – you rock! If I use rotisserie chicken but would still like to use the crock pot, should I reduce the cooking time?